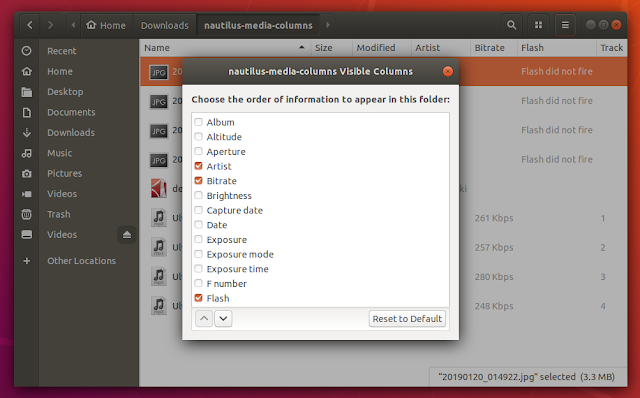 Nautilus Columns is a Nautilus file manager Python extension that adds metadata tags in the Nautilus list view, for audio (mp3, flac and wav), image and PDF files. These metadata tags added by the Nautilus Columns extension are not only useful for a quickly look at some particular audio, pdf or image information from the Nautilus list view, but also to sort some files by a particular metadata tag column to easily identify the files you're looking for. Nautilus Columns is currently maintained by Spanish blogger Atareao, and it only supports English, Spanish and Galician languages. Judging from the extension code, it's also supposed to support some video formats as well, but no information was shown for such files on my Ubuntu 18.10 desktop, so it probably needs some fixes in this area. Audio, PDF and Exif metadata was displayed with no issues on my Ubuntu 18.10 desktop. I tried to install the Nautilus extension on Fedora 29, but I could not manage to get it to work, even after installing some packages that are no longer available in Fedora (python-kaa-metadata and python-kaa-base), so this extension may have some Ubuntu-specific code, I'm not sure. 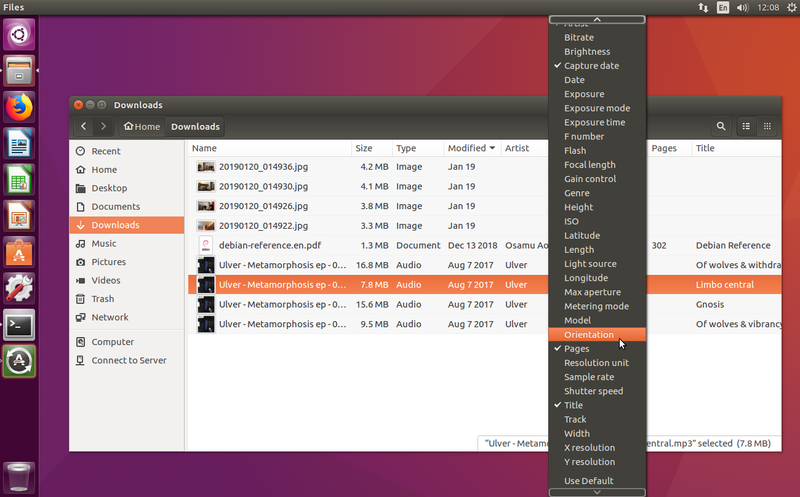 For this reason, this article shows how to install this in Ubuntu only. If you use Ubuntu 18.04 or 16.04, you don't need to install the DEB packages mentioned above - you can skip directly to installing Nautilus Columns as explained below. Now you can install the Nautilus Columns extension by adding the Atareao Nautilus Extensions PPA, or by downloading and installing the DEB. To get started with the Nautilus Columns extension, switch Nautilus to List View by clicking the List View icon to the right of the search icon in the application header bar / toolbar. Next, in Ubuntu 18.04/18.10 click the hamburger menu button (to the right of the List View button), click Visible Columns, and select the new audio, PDF or Exif metadata columns you want to show in the Nautilus list view. The Visible Columns dialog can be accessed in Ubuntu 16.04 from the View menu > List Columns. From the Visible Columns dialog you can reorder the columns to suit your needs. This works differently in Ubuntu 18.04/18.10 and Ubuntu 16.04. In Ubuntu 16.04 you can right click any column header to show or hide any columns, but in Ubuntu 18.04 and newer you'll need to right click the first (Name) column to do this.